Totally hooked on this. Does She-Dwarf have a stay at home dad, or does he just grow it out for the fighting season? Having made candles…I can see how a big ol’ beard might get in the way!! I knew a candlemaker with only a medium-sized one…he was famous for his Troll-B-Gone scented candles shaped like little wizards. Haha, those candles sound awesome! She Dwarf’s dad is the chandler of the family. 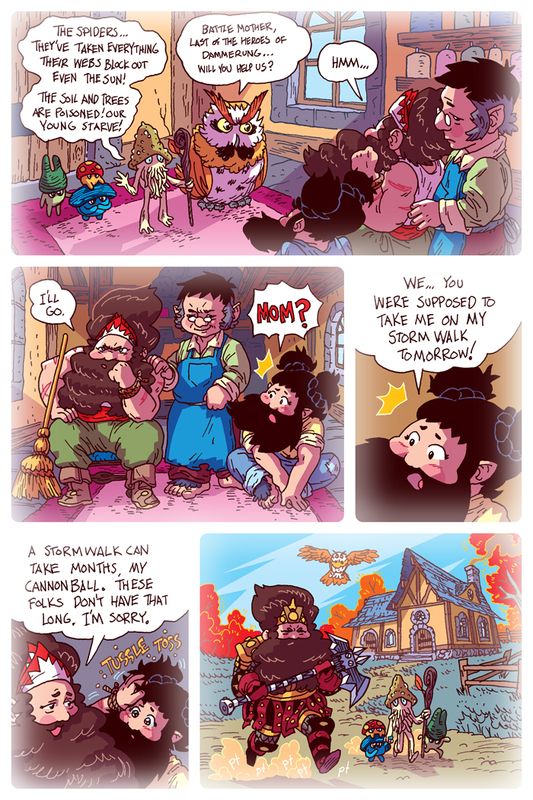 She Dwarf and Battle Mother take care of the rest of the homestead. I also like that he’s beardless. If it’s Dwarf men traditionally do not keep beards or he’s a halfling and this is a mixed race family, I love it either way. Is that owl Pinion Short’s parent?! This is a great question as well! No, but it is an owl from Pinion’s parliament, mentioned on page 8 of chapter 1. OMG I just found this comic, thanks to Jon Erick’s (@HonestlyJon) recommendation on Twitter. I already wanted to cosplay She Dwarf, but now I am almost crying because I want to cosplay her so bad. SHE ME! All I need now is someone with an impossible physique and a taste for rodents to join me as Muscle Hawk. Glad you’re keeping up with this! Thank you! My goal is to hit every week for a year, then ask myself if I want to keep going. It’s been great, so I think I’ll probably keep slogging on! Cheers! So, is she a bit of a Baggins? Or more of a Took? I think with her honor and forthrightness, she may be more Baggins. So is this going to be a Bambi’s mom moment? If Bambi’s mom killed every last hunter in the tri-state area, then yes. And definitely Took. Rumor has it that they took a fairy wife somewhere back in the ancestry. Things not mentioned in Bambi – this is explicitly why the hunter took Bambi’s mom down – it was a revenge killing on behalf of all the hunters she’d killed in her youth. If we could have followed the hunter’s story, we’d have witnessed almost a tragedy of greek proportions, endless waves of death across the tri–state area, men, women, teenagers who wore flannels because they didn’t know any better! But the hunter was crafty, waited until motherhood had made her vulnerable, and then he took his chance (see, normally she’d have gotten him, but to protect her kid, she risked a wounded bird strategy, just as planned)! Yep! That’s why she has pointed ears and fuzzy feet. She’s only half dwarf. Hee hee. Glad you like it! Ha! Guess there isn’t really a term for it… BESIDES TOTALLY AWESOME! Is the MUSHROOMTHULU a recurring character!? I loves it! Her little braids are so ADORABLE!